The perfect combination of challenge, adventure and stunning nature. A dream tour for outdoor enthusiasts. Crossing the mighty Vatnajökull, Europe’s largest glacier by volume, is a challenging and rewarding task that no outdoor enthusiast should miss. This icy giant hides a number of active volcanoes that erupt regularly, with the most recent eruption in 2011 in Grímsvötn. Vatnajökull is also home to the highest peak in Iceland, Hvannadalshnúkur (2110 m). The glacier and the nature around it make up the famous Vatnajökull National Park. Your professional and highly experienced expedition guide will lead you on a journey with conditions similar to those in the arctic. The demanding terrain and weather are what make this experience so unique. 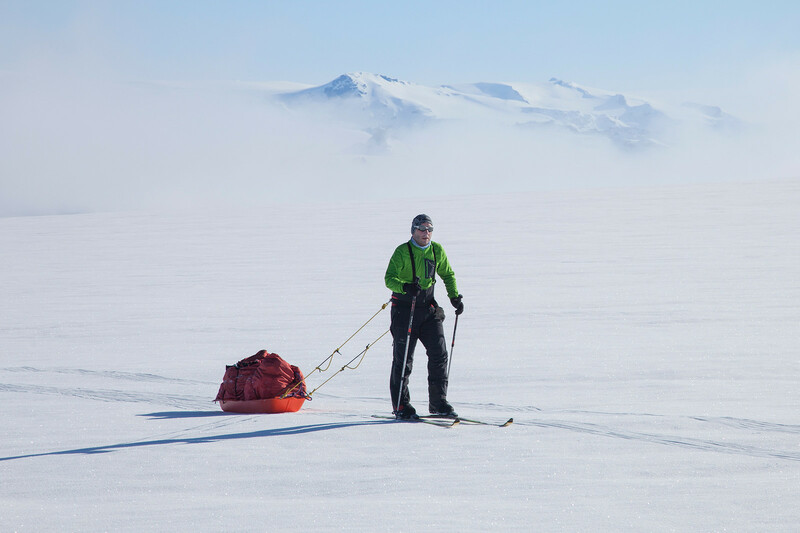 It is the perfect training ground for those who plan on future expeditions in arctic conditions. During your 9-day traverse of the glacier on cross-country skis, you will reach Grímsvötn volcano, the heart of this massive ice field and cross the glacier plateau toward Hermannaskarð pass. Along the way, the surrounding nature will surprise and delight you. The peaks on the south side of the ice cap will seem to grow in size as you travel farther south. Enjoy spectacular views of the Mávabyggðir and Esjufjöll mountains. As you descend the ice field via Breiðamerkurjökull glacier on the last day, you will witness the stunning beauty of the famous Jökusárlón glacier lagoon. Whether you are a seasoned expeditionist or are an outdoor enthusiast looking for a new challenge, this tour is for you.